Data breaches can cost financial institutions millions of dollars. So when third-party vendors have access to systems containing confidential information or sensitive data, it’s crucial to have a strategy for third-party risk management. 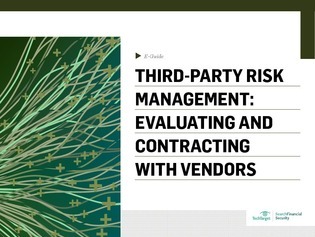 This expert e-guide describes how to use standardized documentation for third-party risk assessment in order to minimize risk before deciding on a vendor. Inside, access advice about the security-related clauses that financial institutions need to include in their vendor contracts in order to comply with regulatory requirements for vendor risk management.